Dim Dining is a restaurant in Antwerpen, Belgium. If you show up there with an Asian tattoo that spells one of their dishes on the menu, you will eat for free. And that “spiritual” tattoo you got once will finally have a good purpose. You either have one or you know someone who has one. A Japanese or Asian tattoo that they claim means something spiritual which is the same tattoo as you mock and claim that really means boiled rice or something like that. 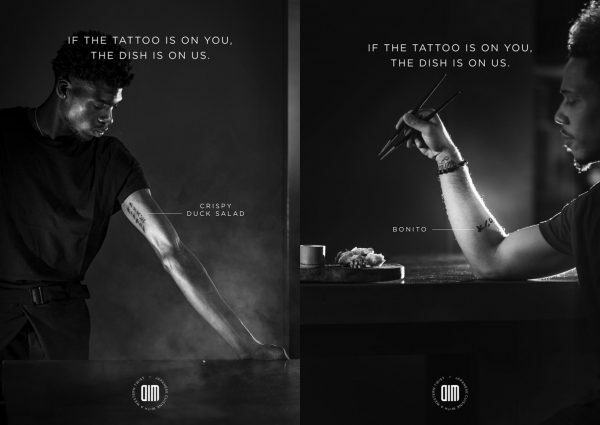 Now the Antwerpen restaurant Dim Dining have taken this to the next level in their new campaign. It’s quite simple, if you show up at Dim Dining and show your tattoo you’ll get that dish for free. Well, almost. You need to register at the Dim website, find it here. So finally you can have an Asian tattoo that means something great. Instead of courage, strength and hope you can choose between Sea Bass Sashimi, Crispy Duck Salad or maybe Wagyu Ribs. All in all, there are 19 different dishes in 6 different styles to choose from. I’m not the biggest fan of tatoos myself but this would make even me consider some ink. Because the food at Dim look quite delicious, and who doesn’t like Japanese food? See the video below for more and if you don’t have the courage to make a real tattoo you can always go for these chef tattoos for cowards.